RideKC Freedom is a shared ride program providing affordable curb-to-curb transportation for registered residents of Johnson County. RideKC Freedom rides may be provided by RideKC Freedom vehicles or through a local taxi provider (10/10 Taxi) that is scheduled by JCT. All procedures and policies remain the same regardless of the ride provider. 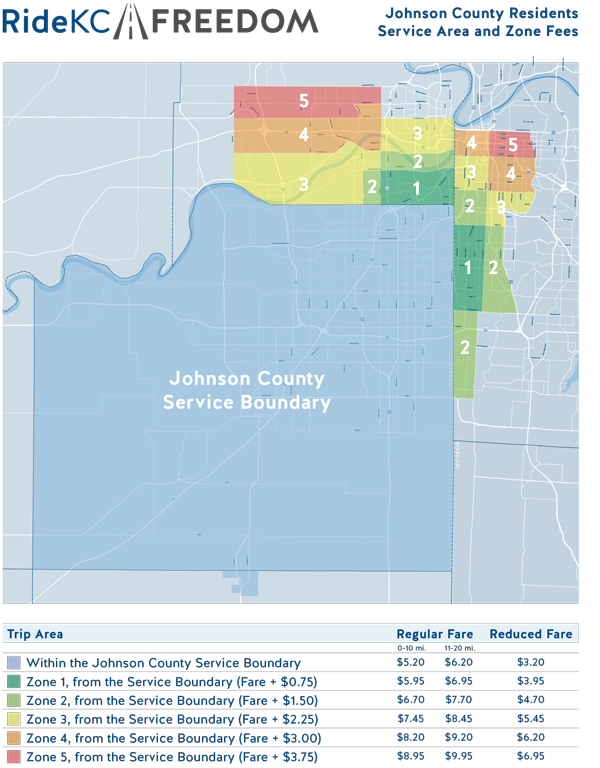 Riders may use RideKC Freedom for any trip purpose within the Johnson County service area (see below), and to Kansas City, Mo. and Kansas City, Kan.
To determine qualification for the reduced fare program, refer to the income guidelines below. Paratransit is available to those who meet certain qualifications. To apply for paratransit service from Johnson County, Kan., KCATA, Unified Government Transit, or IndeAccess, download a printable application in English or Spanish. The application and Ride Guide are available in alternate formats and in Spanish upon request by calling 816-842-9070 and pressing option 5 for Eligibility. You may apply online at www.rideonkcata.com. For reduced fare, use the Reduced Fare Request Form and attachments. The regular RideKC Freedom fare is based on “as the crow flies” mileage and is $5.20 per one-way trip that is 10 miles or less, $6.20 per one-way trip that is 10.01 to 20 miles and $7.20 per one-way trip that is 20.01 or more miles . Return trips will be separate fares. Trips outside the service area (for medical/dental appointments only) will be charged each way using the mileage rate. On RideKC Freedom, please have the exact fare, a pass, or a check for each one-way trip. Drivers do not carry change and will not accept credit cards. Passengers are required to pay each time they board a vehicle. Aides travel free of charge if there is a physician’s statement on file at the JCT office that states the rider requires assistance when traveling. JCT will issue the rider an Aide ID for use by the individual assisting the rider. (Note: Aides are not provided by JCT, they must be provided by the rider.) RideKC Freedom will not bill riders nor will the drivers accept checks for a round trip. Fares for transportation provided by 10/10 Taxi will be the same as rides provided by RideKC Freedom vehicles. 10/10 Taxi will accept cash, passes and credit cards but will not accept checks. Reservations: Once a patron receives an ID card, he/she may call RideKC Freedom and Swift at (816) 842-9070 and select Option 2 to schedule a ride. All ride scheduling, changes and/or modifications must be through the RideKC Freedom Scheduler. Riders wishing to communicate through Kansas Relay may call 1-800-766-3777. Scheduling is available Monday through Friday from 8:00 a.m. to 5:00 p.m. RideKC Freedom rides are based on a first come, first served basis, with the exception of the RideKC Freedom, Premium Reservation Service. Riders should request rides at least two business days in advance or up to a maximum of seven calendar days in advance. Riders may not schedule RideKC Freedom rides through the Taxi company. Cancellations: Un-needed or unwanted trips must be cancelled at least two hours before your scheduled pickup time. To cancel a trip, please call (816) 842-9070 and select Option 2, leave your cancellation on the answering machine, if necessary. If you fail to give adequate notice, you will be charged for the trip. You will be given a cancellation number when you cancel a trip. If you leave the cancellation on the answering machine, you may call back to get your cancellation number. When cancelling a ride, the return trip (second leg) if scheduled, will automatically be cancelled also unless the rider specifically requests it to remain. Riders do not need to call every other week to request ride reservations. Riders will need to call and cancel unwanted trips at least two hours in advance of their pick-up. Cancelling these unnecessary trips allows other RideKC Freedom clients to schedule during that time. No Show and Suspension Policies still apply: Full text of Premium Policy. To Apply for Premium service, download a printable application. If you want to use Premium service and aren't already a RideKC Freedom customer, you will also need to apply for RideKC Freedom: printable application. If you use a wheelchair or a scooter, you must be properly restrained during loading, unloading, and transport. This means that all securement devices must be used and in good working order. This includes, but is not limited to, lap belts, brakes, shoulder restraints, wheelchair restraints, etc. If your mobility device cannot be properly secured, you will either need to transfer to a seat or you will not be transported. By using RideKC Freedom you are agreeing to abide by the guidelines and policies herein outlined. If you have any questions about the guidelines or policies, please call (816) 842-9070 and select Option 5.. If a rider has three (3) "cancel/no show" incidents in a rolling 90-day window, an additional penalty will be imposed. Following all appeal processes, riders will immediately be suspended from riding on the RideKC Freedom program for a two-week period. After the third violation of the "cancel/no-show" policy in a rolling 90-day window, he/she will be charged a ten dollar ($10) fee for every "cancel/no show" incident for the remainder of the rolling 90-day window. Attempting to board a RideKC Freedom vehicle while carrying: firearms or a concealed weapon of any kind; open containers of alcoholic beverages; unauthorized controlled or illegal substances; highly combustible materials; and/or animals (exception: animals trained to assist persons with a disability). Decisions on service denial or suspensions will be made only byRideKC Freedom management staff and can be appealed to the RideKC Freedom Operations Manager. Appeals must be made within five (5) business days of the suspension. An Appeals Committee, consisting of one (1) JCT Management staff member, one (1) Johnson County Transit Management staff member and one (1) member of the Transportation Council will rule on the appeal. The Appeals Committee has ten (10) business days to resolve the appeal. Decisions on service suspension will be made on a case by case basis. The decision of the Appeals Committee is final.